HOUSTON (AP) — Floodwaters reached the rooflines of single-story homes Monday and people could be heard pleading for help from inside as Harvey poured rain on the Houston area for a fourth consecutive day after a chaotic weekend of rising water and rescues. The nation’s fourth-largest city was still mostly paralyzed by one of the largest downpours in U.S. history. And there was no relief in sight from the storm that spun into Texas as a Category 4 hurricane, then parked over the Gulf Coast. With nearly 2 more feet (61 centimeters) of rain expected on top of the 30-plus inches (76 centimeters) in some places, authorities worried that the worst might be yet to come. Harvey has been blamed for at least three confirmed deaths, including a woman killed Monday in the town of Porter, northeast of Houston, when a large oak tree dislodged by heavy rains toppled onto her trailer home. A Houston television station reported Monday that six family members were believed to have drowned when their van was swept away by floodwaters. The KHOU report was attributed to three family members the station did not identify. No bodies have been recovered. According to the station, four children and their grandparents were feared dead after the van hit high water Sunday when crossing a bridge in the Greens Bayou area. The driver of the vehicle, the children’s great-uncle, reportedly escaped before the van sank by grabbing a tree limb. He told the children to try to escape through the back door, but they were unable to get out. The storm was generating an amount of rain that would normally be seen only once in more than 1,000 years, said Edmond Russo, a deputy district engineer for the U.S. Army Corps of Engineers, which was concerned that floodwater would spill around a pair of 70-year-old reservoir dams that protect downtown Houston. The city’s normally bustling business district was virtually deserted Monday, with emergency vehicles making up most of the traffic. Meanwhile, rescuers continued plucking people from the floodwaters — at least 2,000 so far, according to Acevedo, with many more still awaiting rescue. A mandatory evacuation was ordered for the low-lying Houston suburb of Dickinson, home to 20,000. Police cited the city’s fragile infrastructure in the floods, limited working utilities and concern about the weather forecast. Mayor Sylvester Turner has defended the decision and did so again Monday, insisting that a mass evacuation of millions of people by car was a greater risk than enduring the storm. The Red Cross quickly set up the George R. Brown Convention Center and other venues as shelters. The center, which was also used to house Hurricane Katrina refugees from New Orleans in 2005, can accommodate roughly 5,000 people. In the Cypress Forest Estates neighborhood in northern Harris County, people called for help from inside homes as water from a nearby creek rose to the same level as their eaves. A steady procession of rescue boats floated into the area. Harvey increased slightly in strength Monday as it drifted back over the warm Gulf of Mexico, according to the National Hurricane Center. 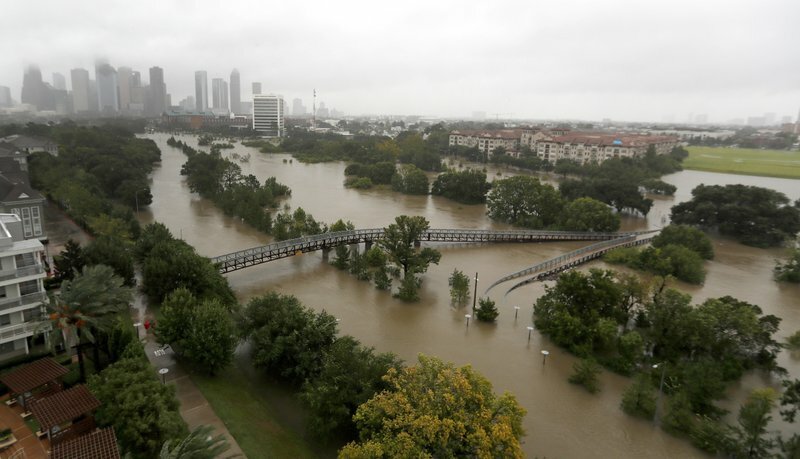 Sometime Tuesday or early Wednesday, parts of the Houston region will probably break the nearly 40-year-old U.S. record for the biggest rainfall from a tropical system — 48 inches, set by Tropical Storm Amelia in 1978 in Texas, meteorologists said. In Louisiana, the images of the devastation in Houston stirred up painful memories for many Hurricane Katrina survivors. “It really evoked a lot of emotions and heartbreak for the people who are going through that now in Houston,” Ray Gratia said as he picked up sandbags for his New Orleans home, which flooded during the 2005 hurricane. In Washington, President Donald Trump’s administration assured Congress that the $3 billion balance in the Federal Emergency Management Agency’s disaster fund was enough to handle immediate needs, such as debris removal and temporary shelter for displaced residents. Trump planned to visit Texas on Tuesday.